It's midnight on the bottom floor of UCSC's physical science building. The doors are locked and the motion-sensor lights have been dim for hours, but doctoral student Hanyu Wang is still in the lab, compelled by a scientific pursuit so gripping, sleep seems trivial. After five years, Wang and Yat Li, chemistry professor at UCSC, have successfully engineered a device that converts, literally, what we flush down the toilet into a zero-emission hydrogen fuel that could power a rocket ship. But here's the best part: the hydrogen-based fuel comes from purely natural resources—sunlight and wastewater. In other words, it's entirely sustainable. Sustainable, and pretty disgusting—at least, as far as the raw materials go. They've made this an unusual and downright odiferous project for Wang, but she does her best to take the funk in stride. Because even though the sewer water smells awful, it contains the cornerstone of the entire operation: a special type of electricity-generating bacteria. "I like my project a lot," says Wang. "I really feel like I'm interacting and connecting with the bacteria. I just really enjoy the process." Her lab mates, however, don't share the same connection with the electrogenic bacteria that Wang has forged over the years, and support their fellow researcher from a respectable distance. "The wastewater always smelled weird when I was working with it," Wang recalls. "You've smelled the sewer before, right? It was just like that. People didn't like to go around my bench, because it was just too smelly." But it's all in the name of science. One day, Wang's research may hugely impact the way we think about energy production. 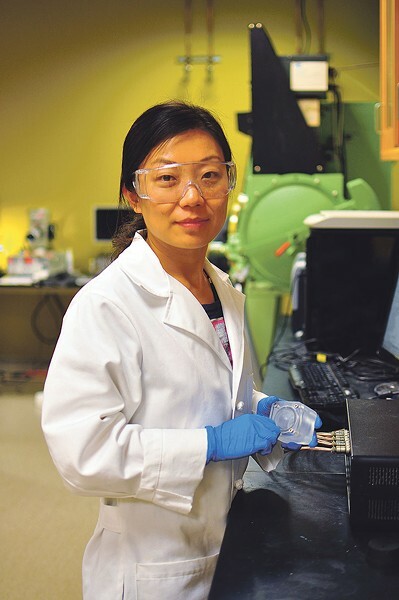 MICROBIAL PROCESSING UCSC’s Hanyu Wang worked on the new solar-microbial device for generating hydrogen fuel. 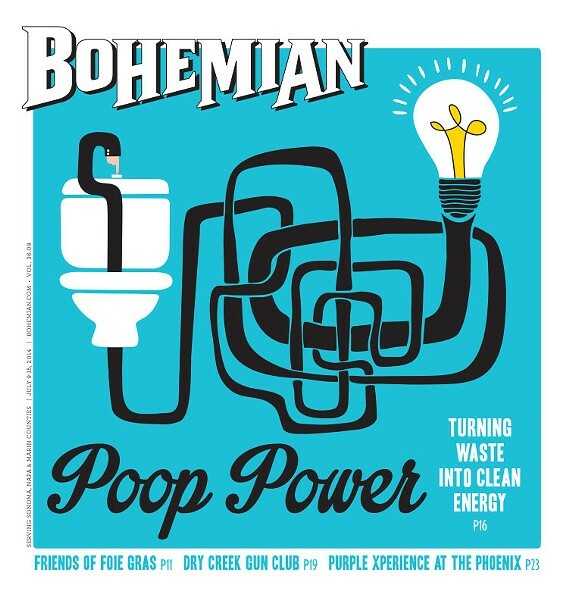 There is poop-to-power innovation happening in the North Bay too. The Sonoma County Water Agency has a couple of rank assets in the renewable-fuels portfolio. In 2011, the agency contracted to build a "farm to fuel" chicken-excrement biogas converter at its wastewater plant. There's also a Petaluma biogas filtration plant at the county-run landfill. Those systems feed the PG&E grid and create fuel for county vehicles. In western Marin County, the Straus and Giacomini dairies use methane digesters to convert cow manure to power, enough to run the dairies and put some back on the grid. Best of all, brags the Straus website, the digester takes the stink off the barn as it generates power for owner Albert Straus' electric car. But hydrogen packs a bigger wallop as a fuel source. With a potential to power cars and industrial machines without harmful emission, hydrogen is an extremely appealing alternative fuel. Though it's often touted as a fuel of the future, it's actually been recognized as a viable energy option for more than 50 years—and NASA has safely used it as a power source for missions since its inception in 1958. With its promise of drastically cut carbon emissions, labs across the country have been working for years to make hydrogen fuel accessible to the masses. So what's the hold up? Cost, for one thing—the production of hydrogen fuel has been prohibitively expensive, so far. Which is precisely why the research at Li's lab stands out: the project runs on sunlight and sewage—two energy sources that are not only cheap but virtually unlimited. Once the device is built, the raw materials cost next to nothing. "We use what's naturally available to us—the wastewater and sunlight," says Wang. "We're in golden California, so we take advantage of that."